Announcement All of my work is completely handmade- from hand-wedged balls of stoneware clay to finished piece. This is the real deal, thrown one piece at a time on the potters wheel, hand trimmed, and hand glazed with my own unique food safe glazes. No mass-produced elements are used. All of my pottery is Handmade,functional,and food safe. 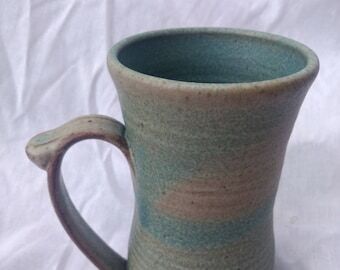 Made from the finest Stoneware and porcelain clays. All of my glazes are individually handcrafted for safety. High fired with natural gas in a reduction atmosphere; makes each piece of functional art strong,unique, beautiful and a one of a kind. I enjoy making pottery with every day use in mind; light and comfortable but also strong and durable. I honestly love what I do, and are truly honored to be able to make a living doing what I love. My ceramic business isn't just about selling people some pottery; it's about making beautiful things that become a small part of my customer's lives. I love to hear that my customers have to use "our favorite mug" for coffee each morning, and that they will go in search of it, and wash it out instead of using another one. It's not unusual to hear that they are back for more, because they're tired of fighting the family for their "favorite" mug or bowl! I hope you will enjoy using these pots as much as I enjoy making them. I'm ecstatic to be living my dream of being full time ceramic artists, and thrilled to be able to share my pottery with you! I come from the small southwestern town of Silver City, New Mexico which is nestled in the mountains, and near the headwaters of the Gila River. I am surrounded by the Gila National Wilderness which includes large Ponderosa forests, deep canyons, Native American cliff dwellings, and natural hot spring pools. Because I personally hand make every piece of pottery, each one has its own individual spirit; although pieces may be similar no two are ever exactly alike - the human touch exists in every aspect of the process. Our pottery also combines all the elements of nature. It is created with earth and water, dried by the air, and reborn by fire. Thanks for shopping with us and being part of our growing circle of pottery friends. All of my work is completely handmade- from hand-wedged balls of stoneware clay to finished piece. This is the real deal, thrown one piece at a time on the potters wheel, hand trimmed, and hand glazed with my own unique food safe glazes. No mass-produced elements are used. Handmade pottery from the mountains of southwest New Mexico. Our pottery comes from the small wild west town of Silver City, nestled in the mountains of southern New Mexico,near the headwaters of the Gila River. We are surrounded by millions of acres of national wilderness,most of it big Ponderosa forest and deep canyons. Indian cliff dwellings, ancient Mimbres pottery shards, and natural Hot Springs pools surround us. We are located over six thousand feet, on the last major mountainous outcropping of the Continental Divide. All of our hand-crafted pieces are made to be used around the home, and to be enjoyed by family and friends. We love making pottery with every day use in mind; light and comfortable, but also strong and durable. All of our work is completely handmade- from hand-wedged balls of stoneware clay to finished piece. This is the real deal, thrown one piece at a time on the potters wheel,hand trimmed,and hand glazed with our own unique food safe glazes. No mass-produced elements are used. And our business isn't just about selling people some pottery; it's about making beautiful things that become a small part of our customer's lives. We love to hear that our customers have to use "our favorite mug" for coffee each morning, and that they will go in search of it, and wash it out instead of using another one. We pride ourselves in offering fantastic customer service.First time buyers often become loyal return customers because they fall in love with our pottery AND our friendly, professional customer service, whether you meet us online or at a craft show. It's not unusual to hear that they are back for more because they're tired of fighting the family for their "favorite" mug or bowl! Because we personally hand make every piece, each one has its own individual spirit; although pieces may be similar no two are ever exactly alike - the human touch exists in every aspect of the process. Our pottery also combines all the elements of nature. It is created with earth and water, dried by the air, and reborn with fire. We honestly love what we do, and are truly honored to be able to make a living doing what inspires us,and thank you for bringing our art into your homes. Thanks for shopping with us, and being part of our growing circle of pottery friends. All of our clays and glazes are individually formulated, hand-crafted and high-fired to cone 10 (2370 F) to make them completely vitrified and food safe. All of our functional pottery may be used safely in the microwave, dishwasher, and oven. We hope you will enjoy owning and using these pots as much as we enjoy making them. Thanks, from our home to yours. All of our hand-crafted pieces are made to be used around the home, and to be enjoyed by family and friends. Because we personally hand make every piece, each one has its own individual spirit; although pieces may be similar no 2 are exactly alike.